Chinese fishing boat near mid sized offshore turbine. MBIA FIGHTS TO STOP FUTURE WINDMILL GRAVEYARD IN LAKE ERIE! Livonia, Mich, September 20, 2018 – The Michigan Boating Industries Association, along with environmental groups, boating associations and property owners are presenting members of the Ohio Power Siting Board with petitions calling for rejection of a proposed wind turbine demonstration farm in the waters of Lake Erie off Cleveland that’s slated to be considered in a closed hearing on Monday, September 24 in Columbus. 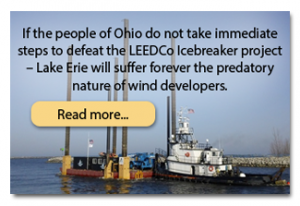 Permits to build the wind farm, dubbed “Icebreaker,” are being sought by the Lake Erie Energy Development Corporation (LEEDCo). Its purpose is to stimulate the development of 1,000 or more wind turbines in Lake Erie and other Great Lakes. But that’s not going to have smooth sailing according to a variety of groups from Ohio and Michigan. Michigan borders on four of the five Great Lakes including a large portion of Lake Erie. Many Michigan residents boat in Lake Erie, and many Michigan businesses and citizens live and work along its shores. Ralston’s graveyard charge refers to the useful life of a turbine on land is under 20 years and likely will be even less after battering from Great Lakes offshore winter ice and storms. At that point they must be decommissioned and removed. Today, California has thousands of industrial wind turbines on land standing abandoned and falling apart. 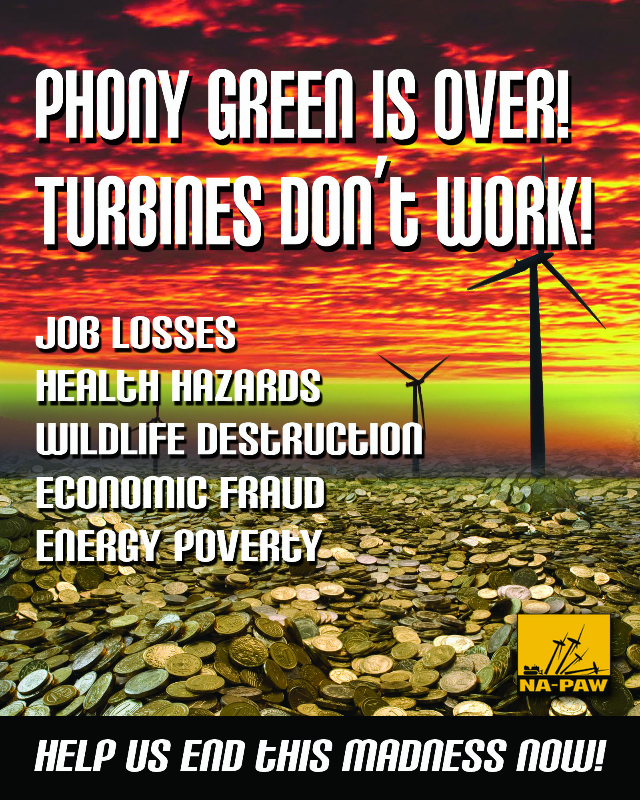 In Europe, many of the wind farms built there 20 years ago lack funds to remove them – so they’re turbine graveyards. 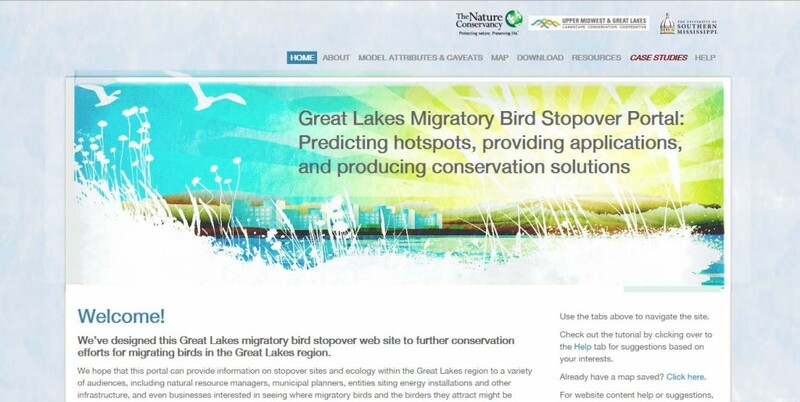 Even worse, damage to the environment is assured, ranging from releasing into the drinking water of millions of Ohioans a variety of carcinogens trapped over decades in the lake bottom, to the annual killing of thousands of birds in direct violation of the Migratory Bird Treaty. In addition, exploding and burning turbines are commonplace. Each turbine contains over 400 gallons of industrial lubricants in their gearboxes. Gearbox seals are known to fail and will leak oil into the waters below. But when they burn there is no way to reach and extinguish them. As the 300-foot turbine blades burn, they create toxic emissions polluting the waters below. 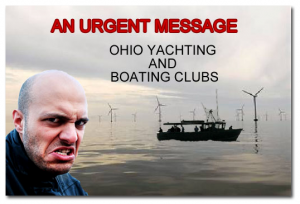 Other groups active in the campaign to get OPSB to deep-six “Icebreaker” include: the Boating Associations of Ohio; Saveourbeautifullake.org; Edgewater Yacht Club; Greater Cleveland Boating Association; nolakeeriewindfarm.org; and the Michigan Boating Industry Association. The latter is providing petitions from hundreds of Michigan residents because Michigan shares a large section of western Lake Erie and believes what happens on Lake Erie will stimulate wind farms in the other Great Lakes. According to the Lake Erie Foundation, what was once called a “dead lake” is now a thriving fishery, source of drinking water, and home to countless waterfowl, especially the comeback of Bald Eagles along the shoreline. But it remains a fragile body of water facing serious algae problems, a myriad of invasive species and other threats to this ecosystem. Meanwhile, leading experts say there is no need for this “Icebreaker” demonstration project. It will not provide insight on any questions related to technical issues, financial issues or any other issues. Its sole purpose, as stated in its permit applications, is to “stimulate a Great Lakes offshore wind industry.” That is unacceptable and it should never be granted approvals.